Disclosure: I received the below product to review. All opinions are my own. Of course the kids favorite ones are the cards that create a picture like the bugs or flowers. This would have been the perfect tool to use when my son was in OT working on his copy/design skills. 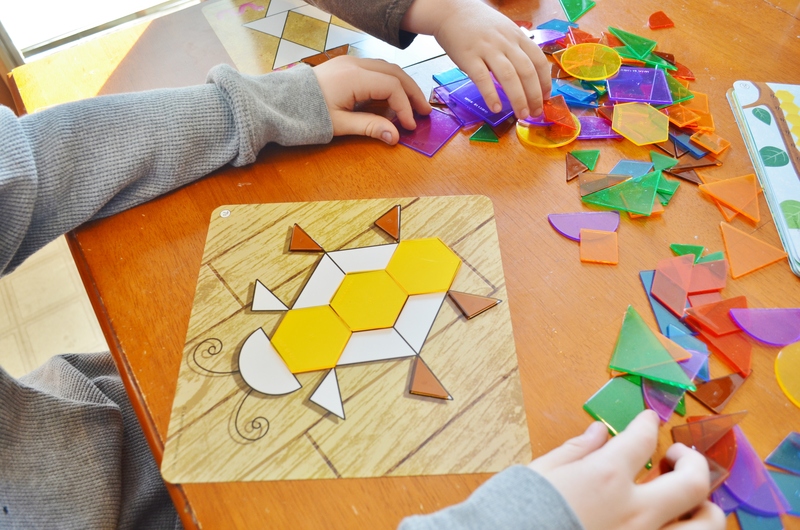 Kids have to find the exact shape that fits the pattern but it’s still simple enough that they can complete it and feel a sense of accomplishment. Not to mention that it’s great for fine motor skills. 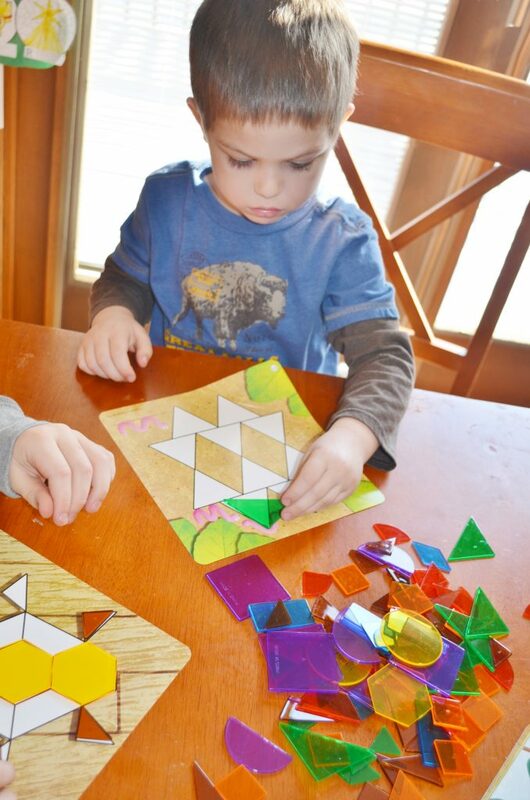 I definitely think this is one of the best geometric shape activity sets I’ve come across! It’s very brightly colored and my kids immediately were drawn to the set. It was great having my 2nd grader and my preschooler work side by side together! 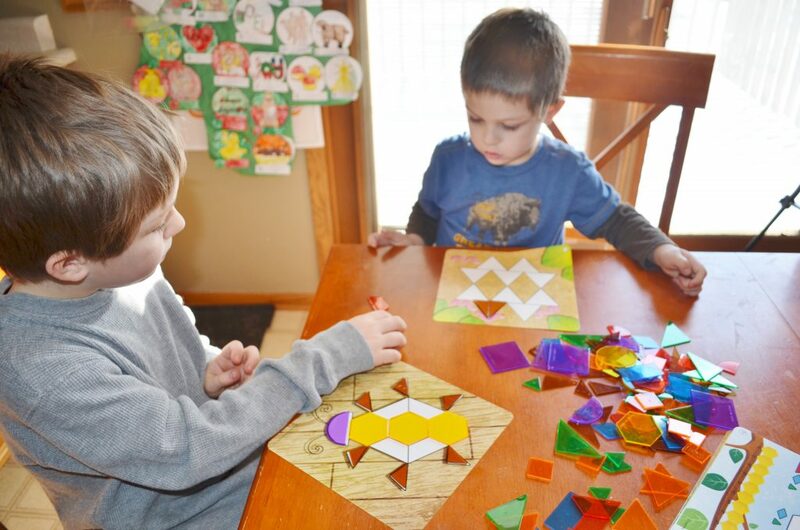 My oldest son helped my younger son out with the shapes since he was getting a little stuck with the several different types of triangles. You can also see that the shapes are translucent so you could certainly use them on an overhead as well. (I love versatile products!) You could easily create your own transparency and turn this into a classroom activity. There are plenty of shapes included in this Shapes Don’t Bug Me Geometry set for more than one kiddo at a time to use. There are really no negatives to this review! We absolutely LOVE this set! There are plenty of shapes, plenty of cards and activities, and a fabulous variety of types of card designs included. This can be used as a classroom activity, center activity, fun at home, therapy, and pretty much in any other scenario that you would want to use these. The Pretend & Play Gym Bag looks adorable! I’d LOVE to use this Reading Rods word game set in class. I can think of so many things I could do with it!! http://www.learningresources.com/product/giant+foam+floor+pattern+blocks.do?sortby=bestSellers&sortby=&&from=fn Giant foam patter blocks! My 3.5 year old would love this! I like this math product. I would love these Take 10 Alphabet cookies to help my son learn his letters! I need a oretend a learn cash register for my dramatic play center in my classroom. My son played with Gears for HOURS! I highly recommend them! The monkey set was his favorite, but this is a good beginner set.